The latest update of Mailbox app for iOS available now, and includes the "auto swipe" function. Save time with the function "auto swipe"
The Mailbox application, which belongs to Dropbox, has been updated to iOS devices. The main innovation in this version 2.0 is the "self swipe" function. This feature was already available on the Android version of the messaging application allows to easily define rules for incoming messages. Clearly, the "self swipe" to automate the most common actions of an inbox, as delete or archive messages with the time saving main objective. Other new features of the update of Mailbox for iOS : bug fixes and some general improvements, especially the ability for users to connect with their identifiers Dropbox to store and synchronize their e-mails on multiple devices. 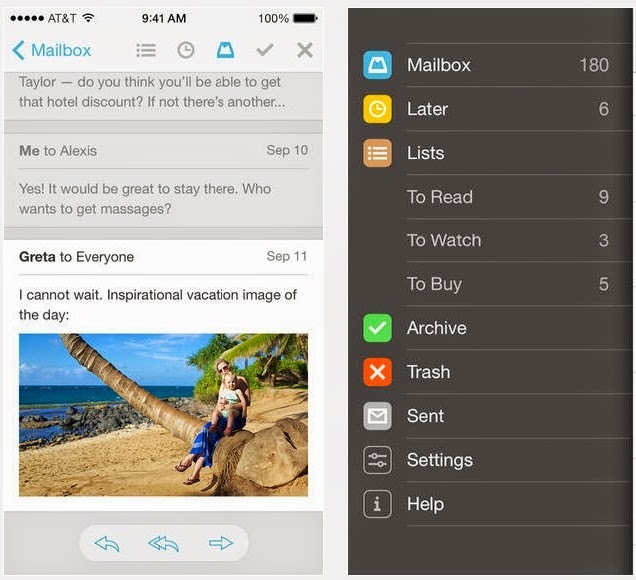 Downloading Mailbox app is free, and requires to have iOS 7 at least.